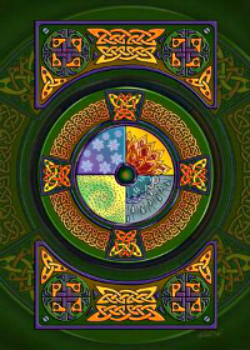 The Celtic knot is the most distinctively Irish Celtic symbol. One of the remarkable things about its design is the way in which its lines typically have neither a beginning nor an end. Providing an illusion of depth to the pages on which they are inscribed, Celtic knotwork designs can be seen on Irish manuscripts and stone carvings seemingly as old as the very soil of Ireland. People from many lands herald these unique knotwork designs as the emblem of their Celtic heritage because the people known as "Celts" lived in many areas of modern-day Europe, spanning far beyond the shores of the Emerald Isle. What most of us call "Celtic" knotwork is actually derived from the exquisite designs created by Irish Christian monks who had come to the Emerald Isle in the Dark Ages to bring the pagan Celts to Christianity. Contrary to popular belief, these designs didn't appear until the mid-7th century when Irish monks began compiling their illuminated manuscripts of the Christian gospels. Actually the monks who came to Ireland were influenced by the knotwork styles from the Middle East. Knotwork is found originally in ancient Syrian and Coptic manuscripts. Nevertheless, as the Irish monks began creating the beautifully adorned illuminated manuscripts, such as the Book of Armagh, the Book of Durrow, and the Book of Kells, they took the designs they brought from those lands and created a uniquely Irish art form. While there are countless prehistoric Celtic symbols, Celtic knotwork is the distinctively Irish contribution to ancient Celtic designs. By the 8th century, interlacing knotwork had become the defining characteristic of Irish art. For instance, the simple triquetra, commonly known as the Trinity knot, takes an individual strand and wraps it into and onto itself, such that it becomes a three-lobed, yet singular design. In the pagan mindset this design symbolized the connection of the three planes of existence: mind, body, and spirit. To Christians, it illustrated the essential core of Christian belief wherein one God was Father, Son, and Holy Spirit. 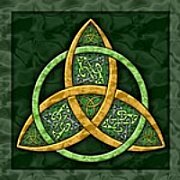 For both beliefs, the Trinity knot symbolized the way in which three separate essences were vitally interconnected. Many people also believed that the interlacing was a protection against evil. Just as we, joined together, can defeat evil, so were Celtic knots designed to defend against evil. The more interlacing, the more powerful the protection. There is, indeed, safety in numbers, even in this distinctly Irish form. Another simple form is the Lover's Knot, or the Eternity Knot. Used in many Celtic wedding rings, it shows two continuous, unbroken loops that are intertwined and inseparable from each other. As the lives of the bride and groom are merged in eternal unity and fidelity, so are the circular strands inseparably bound together for eternity.